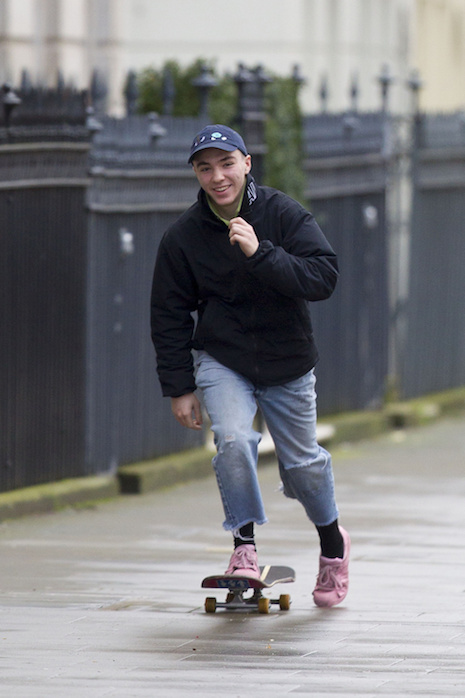 Rocco Ritchie, 15, looks happy as a clam skateboarding in London. A month ago he ditched him mother Madonna on her Rebel Tour and went to stay with his dad, director Guy Ritchie. He says he prefers the normal family life he has with Guy and his wife Jacqui and their 3 kids. Rocco has lots more freedom in London where he isn’t so often recognized. (And it’s easier to flirt with girls.) The probability of a real custody battle became clear when Rocco did NOT show at his fancy NY school on Monday after the Christmas holidays. And Madonna thought she was the perfect mom! I’d be happy also being far away from that hell hound of a mother. Madonnas is a beast of a human being… Well away from her is a treat! With her enormous ego, I don’t see how there is room for anyone or anything else in Madonna’s house. I can only imagine how controlling she is with what the children. On the up side, since she and all the children practice a strict macrobiotic diet, they are probably much healthier than most. What kids are still with her on the tour? Macrobiotics is a wonder diet for those with certain concerns. You don’t get brownies, cookies, fudge, or roast beef, but you get healthy. no such thing as a perfect mom or dad or perfect kids. hes 15 years old , he will legally be an adult in three years time. i think its normal that he wants to spend more time with his bio dad and not on tour with his mom who seems busy chasing dudes nearer to her sons age than her own. she is, he grows up like an average adolescant. His picture says it all. He looks very happy now that he’s with his father. I agree with everyone’s comments before mine! And I’m really glad he is able to be with his father and living a more normal life (less centered around his mother’s ego). And good for Guy Ritchie who, also having money and fame in his own right (just as Madonna does), cares about doing right by his son.